Rusted Roots hair salon is located on Clifty drive in Madison Indiana. Rusted Roots styles and cuts hair for women, men and children. They have been in business since early 2000's. 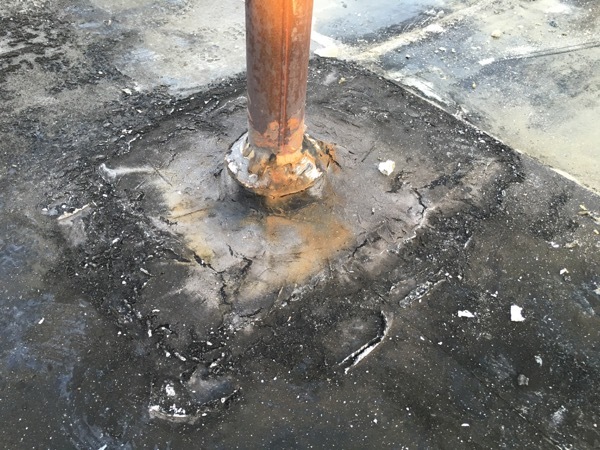 They have a large and dedicated customer base, so when leaks in the buildings flat roof began to create messy and wet conditions inside the salon, something had to be done. They contacted Exterior Pro roofing to get professionals involved in finding a solution. Once Exterior Pro had assessed the persistent leaks during the rain and snow, they also found that the buildings inside temperature fluctuated greatly. During the hot summer months, the salon was warm and during the winter months of the year, the building just would not warm up and stay comfortable. 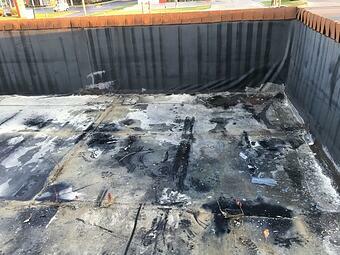 Exterior Pro found that the building lacked poly ISO roof insulation. Since the roof was under insulated and the existing roof was saturated with moisture, this meant that a flat roof tear off was needed. 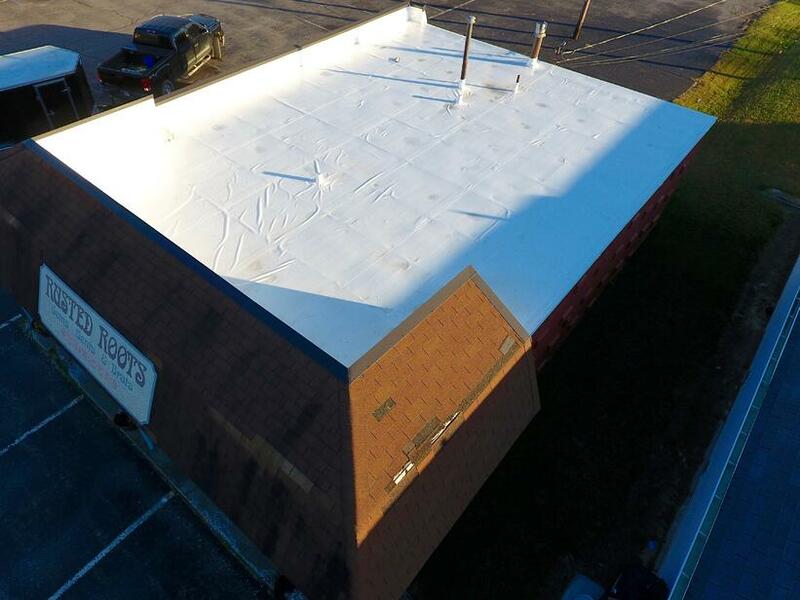 With the tear off, the existing old wet roof would be removed, allowing Exterior Pro to properly insulate the building before installing a new white PVC roofing membrane. 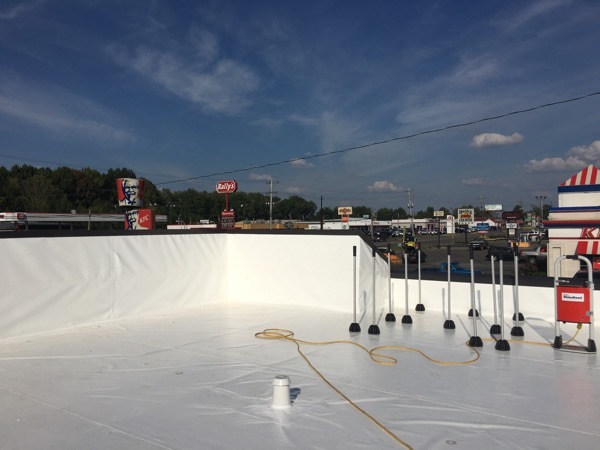 The goal for day one was to get the entire roof moved, install two layers of new roof insulation, and install the new PVC roofing membrane so the building and contents were not exposed to the weather. A five man crew of skilled flat roofers easily obtained the goal. Crew leader said, "We knew that tearing off the old flat roof would be somewhat noisy inside the salon and we wanted to consolidate the noise and inconvenience to just one day". The goal of the second day was to finish up the flashing around the pipes and to make a coping cap to cover the top of the parapet walls. This was easily accomplished by the end of day two. It took just one day for the stylist at Rusted Roots to notice the more comfortable and stable air temperature inside the building. The two layers of new roof insulation really makes a difference and the white roofing membrane reflects Summer time heat instead of absorbing and transferring heat to the building.